What is the great human fear? I think it is the fear of being replaced or forgotten by those we love (or even the world at large). I propose to you that is the reason why Toy Story is such a great movie. Yes it’s a game changer in the world of animation and yes it introduced the world to 2 of the most delightful characters in movie history but at it’s core is a message that we can all relate too. Toy Story is of course Pixar’s first animated feature film and the first CG film from any studio. After getting Oscar recognition for Tin Toy the idea of a lost toy started with John Lasseter and crew and they were able to convince Disney to sponsor their project. It took them 5 years to make and what they came up with is one of the most likable entertaining animated films ever made. I asked on facebook and twitter- Any thoughts on Toy Story 1? What impact did it have on you? Do you love it? What do your kids think of it? I love, love, love all of the Toy Story movies. They’ve been been very formative on my life. For one thing, they taught me that you shouldn’t abuse or mistreat anything whatsoever, on the off chance that they are sentient. It completely changed the way I look at animated film. The script was so refreshing and the computer graphics blew me away! It’s still my favorite animated feature film. My girls are 18 & 19 and they grew up on Toy Story and they still love it today! I loved it as a kid. I had a toy Woody and a toy Buzz who I played with a lot. I’m actually the exact same age Andy was in Toy Story 1 and 3, and I went to see Toy Story 3 on my 18th birthday the summer before I went away to college. Suffice it to say, many feels were had. I LOVE Toy Story. My 4-year-old loves it as well. I try to only get him hooked on movies that I don’t mind listening to thousands of times over again! Hahaha. I loved it! 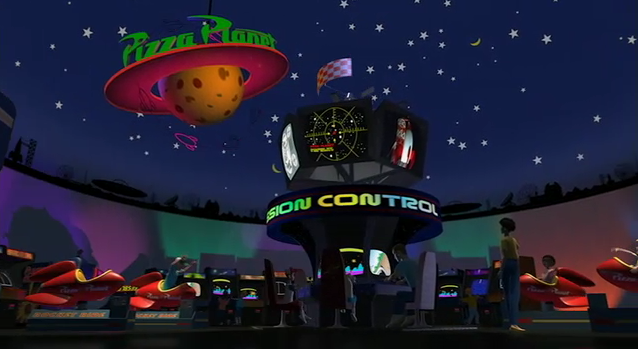 Wish I was having lunch at Pizza Planet. I particularly like that last sentiment. Toy Story is such tight storytelling. The beginning is all to build up the introduction of Buzz. We see Woody as basically the CEO of the bedroom. Everyone has their job and he is comfortable in his spot as the leader. They even have a little staff meeting. But suddenly this new seemingly better version of Woody comes along and just like any kid would do Andy is super excited; thereby quickly unraveling Woody’s world. The posters are gone, the old west town cardboard is gone and a spaceship has replaced it and finally Woody’s spot is now a Buzz comforter and sheets. At least for that moment Woody has been replaced. Woody then experiences two of the most deadly sins but we can all relate too- envy and jealousy. He’s envious of what Buzz has that appeals to Andy and the other toys and he is jealous of all that Buzz has taken away from him. He handles these emotions sometimes being angry, sarcastic, sad, and depressed but it is always a response that at least I relate too when I’ve been faced with similar situations. We are also always given bits of joyous comic relief like the famous flying sequence. The other thing that is so brilliant in the Buzz and Woody relationship is they are seeing the same things and yet in totally different worlds. Buzz is a space ranger and is seeing everything through those goggles. Woody is a toy and looking from his viewpoint. How often in life does conflict come from 2 worldviews crashing into each other like that? Again another reason why so many children and adults relate to Toy Story and love it. Once Buzz and Woody get lost the story becomes a real journey. This is perhaps one of my favorite scenes in all of animation. ‘You are a toy!’ Again it’s those two universes coming into conflict. The design in these sequences is just beautiful. The stars at the gas station and the fun of Pizza Planet. I agree with Terry I wish I was having lunch at Pizza Planet. Then the story moves to our villain Sid who is actually a really creative kid in a lot of ways. He isn’t just playing but creating; however, in the world of the movie he is basically an evil mad scientist who is murdering toys. It totally works within the world of the movie. The brilliance of the sequences at Sid’s house is Buzz is not Woody’s competition any more but his only ally. It’s kind of like you may hate a person in your sorority but if it is only the two of you walking down a scary street all the sudden you feel this bond. Group dynamics work that way! 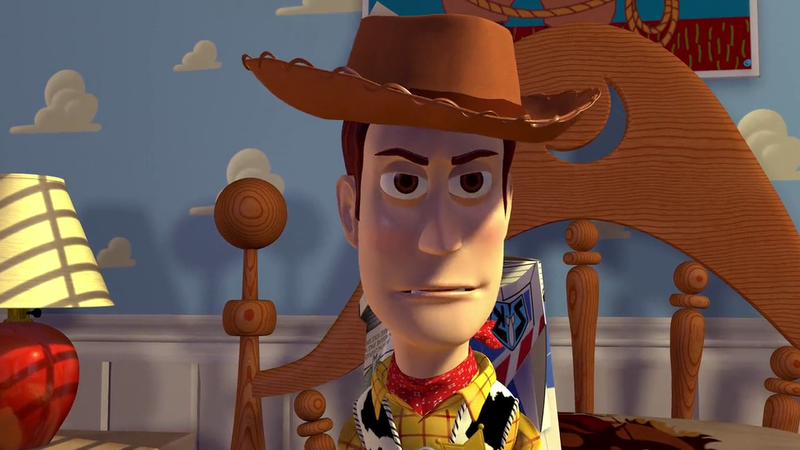 Buzz also learns that Woody is right he is just a toy. Surely we can all relate to that moment where we realize we are very small insignificant person in the grand scheme of things. That’s what makes this scene so powerful. Randy Newman’s music is wonderful for especially the Toy Story movies. He has a modern feel mixed with a Great American Songbook style. It describes what’s going on without being too literal, poetic while still feeling marketable which is perfect for a movie about toys. It just works. 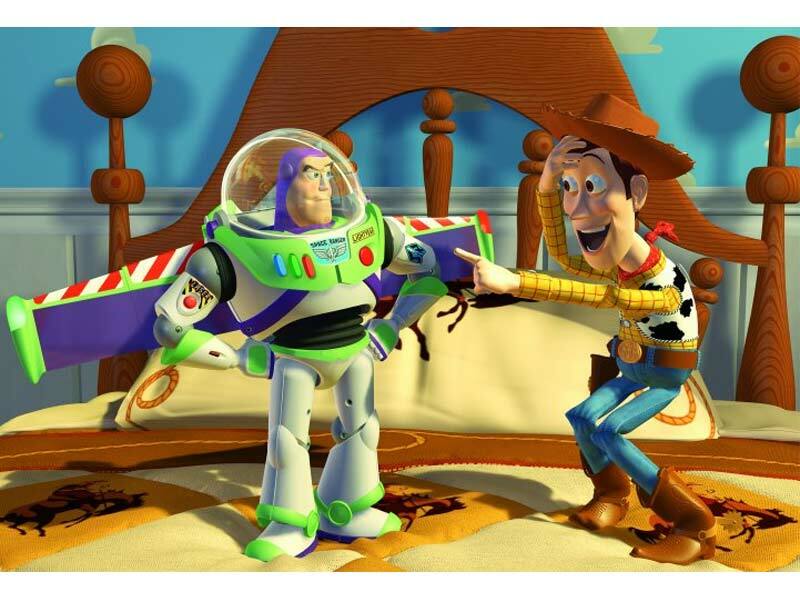 As tension builds Buzz is tied to the rocket and Woody has to think of a way to save his once enemy now friend. He realizes these creatures he once feared are really wonderful (another good lesson for kids) and they stage a little lesson for Sid. But that’s not the end. No they have to get to the moving truck before Andy leaves. This last segment is so great both plot, animation-wise and everything else. It is such a triumphant moment for Buzz when he realizes he can save the day for the people in his life (again a very relatable emotion). All the voicecasting is great especially of course Tom Hanks and Tim Allen who are just perfect for the roles. Who would have thought Tim Allen when he was on Home Improvement would make a great space ranger toy but it works. Tom Hanks is more of an obvious choice but his experience in both comedy and drama make him the right pick for the part. All the side characters are completely lovely with Potato Head Don Rickles probably being my favorite. John Ratzenberg is great as Ham. Annie Potts as Bo Peep and Jim Varney as Slinky Dog are all great. They were so clever too with details like watching the Mr Spell or the Etch-o-sketch for little jokes. It’s also brilliant to have a dinosaur that should be fierce be neurotic. Wallace Shawn is terrific as Rex. They all have accepted their place like in a business and work together well. Even when they are ostracizing Woody it makes sense from their point of view. 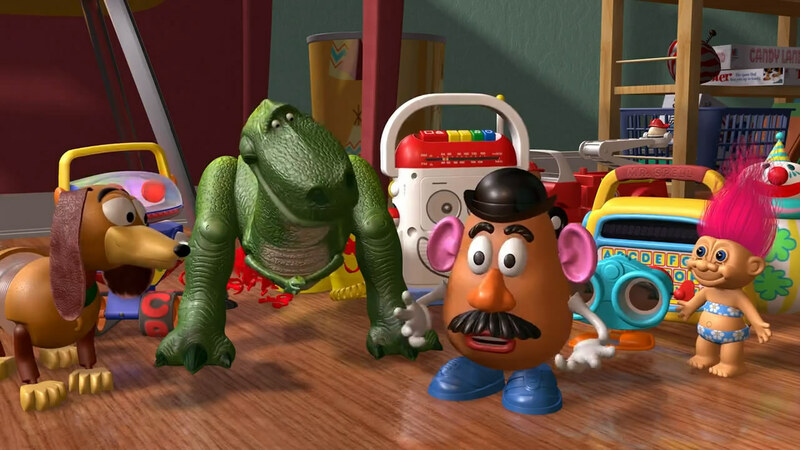 Anyway, what more is there to say but Toy Story is not just the first CG animated film but it is one of the best. The story taps into themes we can all relate too and taps into universal emotions. It also gives us some of the best characters ever in film. The adventure is so much fun and it still looks great today. I love it. If it was the only Pixar film I would still be singing their praises. Overall Grade- A+ (you’ll see that a lot in these Pixar. It’s just the way I feel). Toy Story was so well loved that the academy gave it an honorary award for special achievement and I think that was the catalyst for the Best Animated Feature Film category, so great films like Toy Story wouldn’t be ignored in the future or need special awards. It’s really touching to hear John Lasseter talk about the films creation and team. There’s nothing bad one can really say about ‘Toy Story’. I know swanpride finds the film somewhat overrated though. I actually associate Toy Story with my dad quite strongly. My dad hasn’t come on very many cinema trips with me, but it was a whole family outing to see Toy Story, and I was surprised at how much he loved it. He talked about it with just about everyone. One of the things he kept repeating was “It’s wasted on kids” – it sounded a bit derogatory to me at that young age, but I guess he was referring to its real all-age appeal. That scene where Slinky is talking about how they should trust Woody’s judgement, and Mr Potato Head takes off his mouth and presses it against his bottom – it was YEARS before I got that joke. Toy Story is definitely among my favourite animated films: Tom Hanks is my favourite actor, and this is one of his most fun roles. It amazes me how far movies have come when twenty years ago, a completely computer-animated feature film was a big deal. Thanks for sharing that about your Dad. My parents aren’t much of movie folks so the one’s we have shared together are extra special (perhaps part of why I love Beauty and the Beast is went with my whole family to a special old theater with a balcony). I know what your Dad was saying with ‘it’s wasted on kids’. It could have been the humor but I think these deeper themes of friendship, overcoming envy, group dynamics are probably a little over a kid; although kids constantly surprise me with what they absorb. At the very least it is a film that entertains both children and adults. It’s interesting I was coming into this thinking I would probably give it an A not an A+. For years I thought Toy Story 2 and 3 were better. After watching I’m not so sure. Toy Story 2 is funnier and the introduction of Jessie is perfect but the original is amazing. In the end, who cares about ranking. It deserved an A+ so that’s what it got. It was better than I remembered it. How many movies can you say that about? And totally agree on the voice performances. They were so lucky. Tim Allen had just done the pilot for Home Improvement when they signed him. Tom Hanks had just filmed Philadelphia. If it had been another year they would have probably been out of their price point. Can’t imagine anyone else in those parts. It’s certainly one of the best! 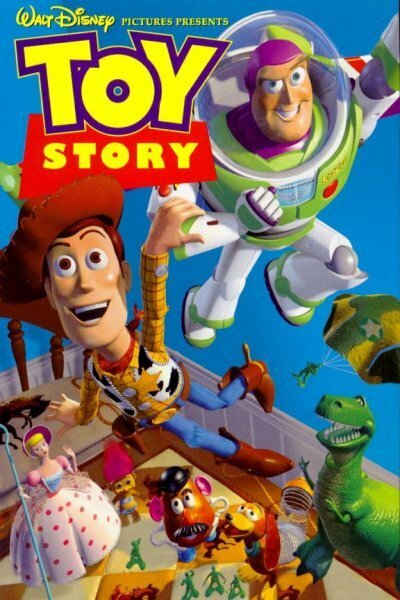 Check out the movie blog for my review of Toy Story. 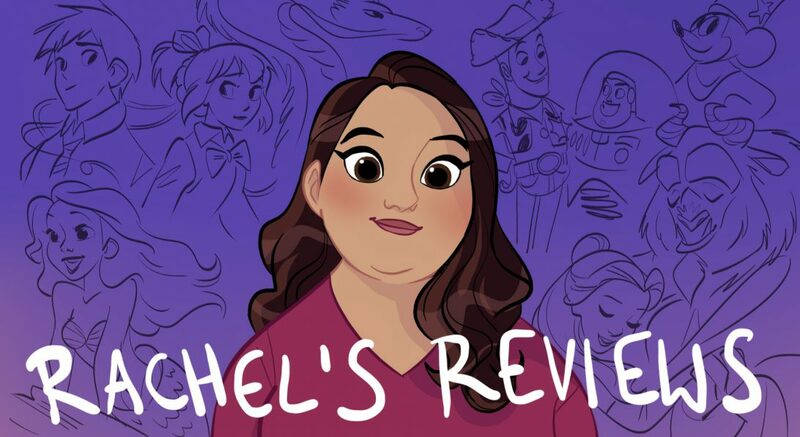 I am reviewing all the Pixar films and shorts and I think you will really enjoy them. Toy Story is just the best. Awesome review! I like the first one a little bit better, but this is great too nonetheless. 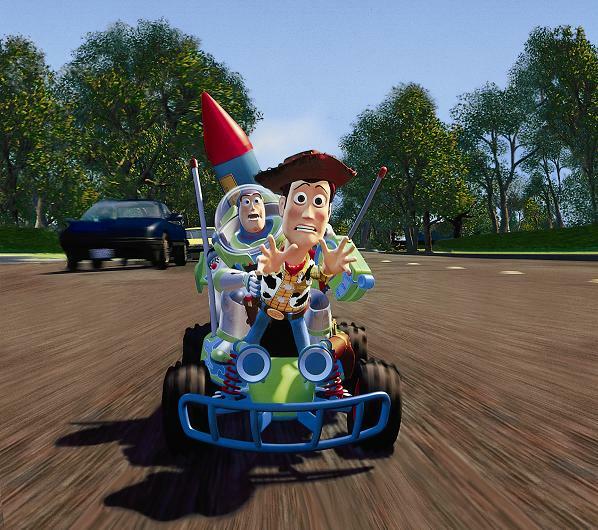 By the way, did you know that there’s a Toy Story 4 coming out in 2017? What do you mean the first one better? It is the first one. I did know about Toy Story 4. According to producers it will not be a continuation of Toy Story 3 but a love story between the toys with little to no child involvement. Oh, my bad for the typo! I meant to say I liked the second one a little bit better. Oops! Anyway, if that’s true about Toy Story 4, that’s good because I honestly don’t see how the story could continue following the third one anyway. Well, great review once again! Me too. I figured that’s what you meant. I used to think I liked the 2nd one better but after watching 1 this time I’m not sure. We will have to see what I think after 2 and 3. Either way they are all great! You know, I’m not going to lie, I think it’s great that you’re doing a Pixar marathon since there are not one, but two Pixar films coming out this year. I know you mentioned you’re excited for Inside Out next month. I definitely am too. I will also likely be curious to see how The Good Dinosaur looks. Very excited for Good Dinosaur but have no idea what to think. It’s not only 2 Pixar films this year but 2 original Pixar films. I think I’ve died and gone to heaven. Oh dear and wow that you’ve likely died, but had gone to heaven respectively. Anyway, hope both are great Pixar films. I like this film; I find i to be a really great and relatable film, but I do think that it is a little bit overrated. The story, characters, etc are great, and I do agree with what was said above, but there is a lot that is ordinary and formulaic about the film that some tend to ignore. I am not saying it is a bad thing, but to me, it is just a bit more formulaic (with the whole buddy buddy formula) than what some recognize. It is still a great film nonetheless, and a good start to Pixar and CGI animation. Thanks for the comment. I agree it is a formula but I don’t think formulas are a bad thing if executed well. There after all only 7 plots in all of literature so nearly every book or movie can be whittled down to a basic formula (coming of age, the quest, redemption, romance etc). Very rarely does something come along where I can say ‘that is an original story’. I think what surrounds the basic formula is what matters. 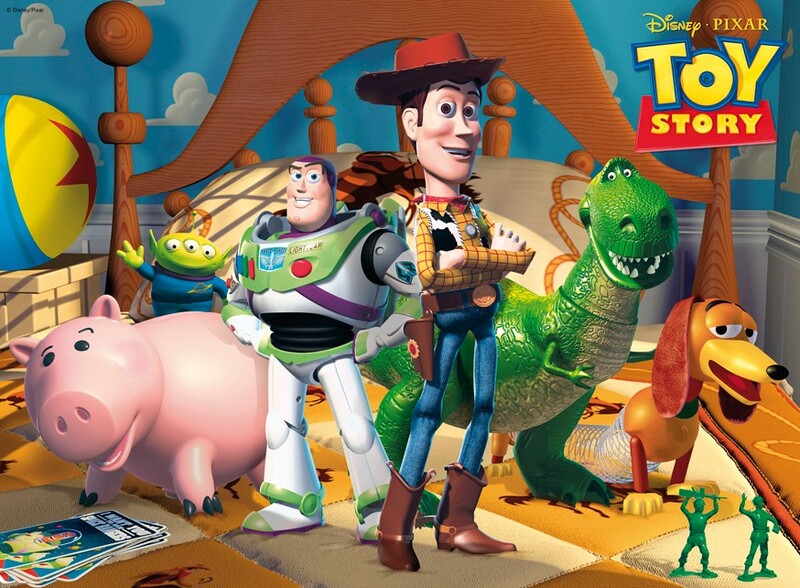 With Toy Story the world is so original and the script is witty and sweet that it makes it feel original. Also just that core emotion of a character experiencing anger, jealousy, envy, forgiveness helped me bond with Woody in a special way. But I can see what you are saying and I’m glad you enjoy the movie even if you think it is a tiny bit overrated. It’s all good! When I was about 5 years old, Toy Story didn’t really stand out to me that much because I was probably a bit too young to understand it’s deeper themes and morals, and had then decided I liked other Disney movies more. I still watched it A LOT, and each successive viewing made it better and better for me. I didn’t really comprehend how groundbreaking the 3D animation was, not just for its time but even more so considering how most of it holds up nicely. I don’t even mind the wonky way the humans look, after all if you were a toy looking up at the world everything looks out of proportion to the human eye. Within a few years, I went a full 180 and realized that Toy Story (as well as Toy Story 2 and much later 3) was an inspirational film. As I got older I found myself revisiting it along with the other Pixar films and saw the brilliant writing and memorable character dynamic. If someone plays “You Got a Friend In Me” then that will just get me (and anyone my age or a bit younger) bursting into song. If I had anything more unique to add, I would say that Toy Story reminds me of my older brother in a way when we were both little, he was very much the serious and authoritative Woody while I was a lot like Buzz before he got his mind cleared, often clashing and making up like Woody and Buzz did over the three films. 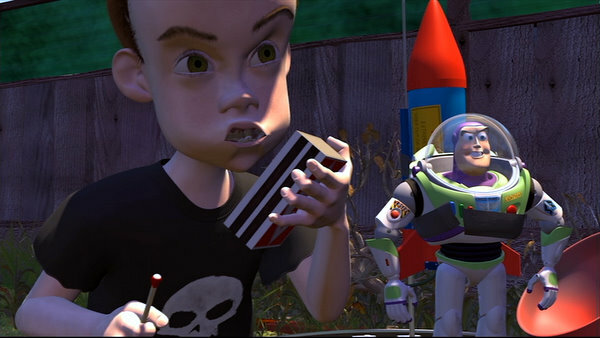 Buzz’s sad realization that he was just a toy reminds me today of the first time I left like I was truly growing up and how hard the next few years would be, but like Buzz I like to think I triumphed over it. Even growing up, I saw more of the brotherly bond between the two toys than the often discussed (but still relevant) comparisons to Woody as a father figure for Andy. Another great comment. I think a lot of us had that experience with Toy Story. We looked at it as a kids film that was sweet and all but then revisited and saw the hidden depth to it. It’s really a lovely film about the dangers of jealousy but also the power of forgiveness. That is all handled so well. I also like as you say the idea of Buzz growing up and seeing things as they truly are not as he wished they would be. We all go through that experience and Pixar captures it again and again in their films. Toy Story did it first and perhaps best (although Inside Out is pretty amazing in that regard). I was expecting to like Toy Story in this rewatch but I came away really loving it. It’s not only great because it is first. It is great because it is very well written and put together. It’s got it all- humor, scares, and moments that make you think. I love it!